Welcome MyHolden, Great bunch of guys here who are always ready to help out. If you haven't already get your self a headset with microphone and join us on TS. Thats the easiest way to get help. Last Edit: 6 years 8 months ago by Nibiru. Thanks Mate, could i ask a question? 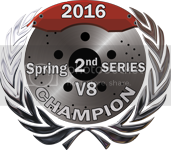 i signed up on SLS for the V8 Spring Season is that all i need to do to sign up? You might like to check out the "XFactor Membership" tab on the home page. This will give you details of our rules, TS settings and membership fees. Last Edit: 6 years 8 months ago by Bert. As Robzee stated there are membership fees and different memberships depending on what you want to race.. if you are considering getting a membership keep in mind that if you would like to race in our season following the v8's you will need a GOLD license we do also have shorter season's on the off weeks not requiring gold. but basically a gold license will get you into every race on every Monday and Wednesday every week which i believe is well worth it. great place to start , here with us ,thanks for coming over to xfactor . we have links for everything you need, ts is used by all of us , . jump on on have some fun . Welcome mate, I'm new to XFactor as of DEC11 and you will have a ball, great bunch of blokes here and very helpful.